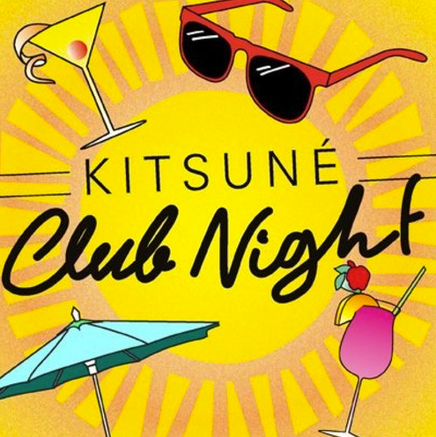 Kitsuné Club Night is back in London at the Village Underground on June 22, where you can dance to the sounds of Gildas, who’s proved his musical sensitivity many times through his remixes and DJ sets or through his sense for new talents that he contributed launching through Kitsuné. Jerry Bouthier is on too, making time on his schedule between his residencies in Barcelona, Berlin, Milan, Amsterdam and Paris. 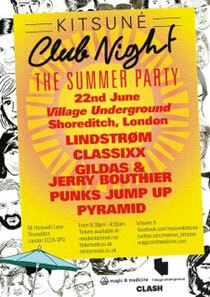 Lindstrøm will also bring a little fresh Norway breeze with his disco-electronica sound. Founder of the Feedelity label and winner of three Spellemannsprisen, his discography is as impressive and polished as what you can expect from a Scandinavian. His recent collaboration with Todd Terje, who also mixed his last album ‘Smalhans’, confirmed that when it comes to make you dance on endless loops that keep you from breathing, Lindstrøm is the one. Pyramid has been collaborating with Kitsuné on a few projects after winning the Kitsuné remix contest. Making a name for himself, he tackles a slow and funky retro repertoire that won over a lot of people, which he proved with the success of his track ‘Wolf’. Punk Jumps Up energy on stage means that they are always touring, remixing and playing at Kitsuné Club Nights. Finally, Classixx and their blend of disco-funk-house-indie-rock complete the night.